Okay so this is what happened while I’m struggling with my almost chopped off thumb finger and a piece of bandaid which got me first typing with 1 finger and then after removal of the SUPER adhesive bandaid thing got me glued to my iPhone and all. So basically a normal day for me. Blog about my highly impressive clumsy and Faceversary festive day you can read here. During my glue fight with the iPhone I see this notification buzzing around my screen again: it’s James!! 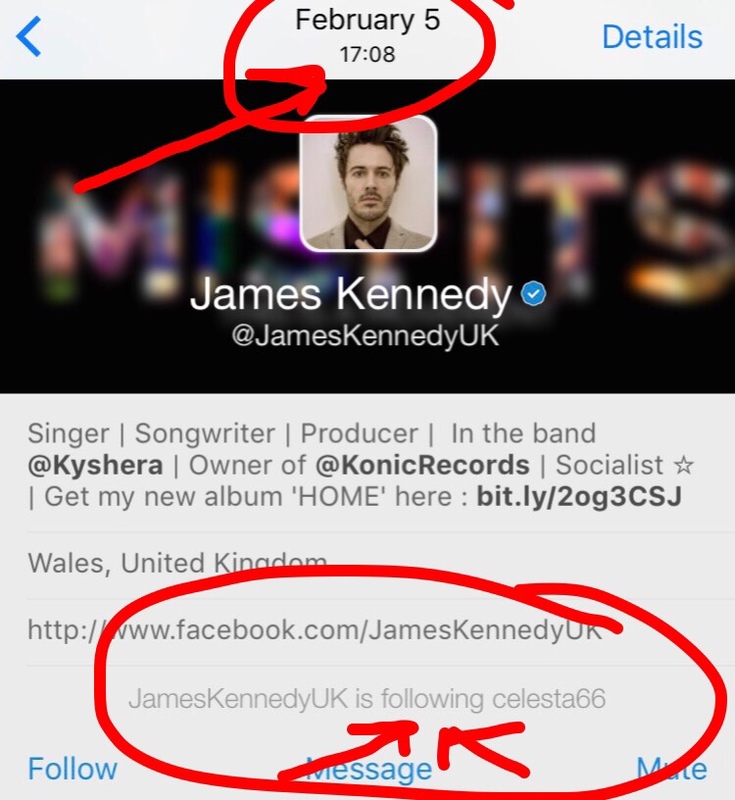 Good old James; the follow-unfollow-then-againfollow-jameskennedyuk-James. You know…. from the band Kyshera; you don’t? Well you should! I think. Well ok…..ok….oh..uhh. Well, ok James, what to say? First you follow me, then you unfollow me, then you follow me again. Are you doing some kind of traffic light impersonation here? I’m not going to jump up and down now as I did the first time you followed me James! We (me and me) can not do that every time you follow me; first you got me lyrical about you and your verification status and all, then you got me all broken down after your hystorical ‘unfollow’-action deed. Are you aware what that does to people. No ofcourse you’re not: you’re a celebrity, I think(???). Celebrities don’t think (I think) and aren’t in any way karma affected by the sometimes awkward, obnoxious and antisocial behaviour towards fans or journalists. First they trick you in liking them to subsequently eject you with the same speed they approached you in the first place. It’s like you think you’re getting a kiss from someone (well hopefully not every someone but a special someone) and on the moment suprème they let you kiss a dead hamster instead (because you had your eyes closed ofcourse people). Celebrities (well most of them. Well ALL of them) are totally in love with themselves. I once interviewed a lot of (inter)national celebrities and they have all in comon that they LIKE themselves very much, as in very very very much, even to the point they complain to randsom ducks (in the wild) or dead mirrors about sometimes NOT being LIKED by someone. Yes really, they Google themselves literally goony; I’m so not making this up, they told me they sometimes have a BIG nervous breakdown about people NOT LIKING them as much as they love themselves ya’ll. 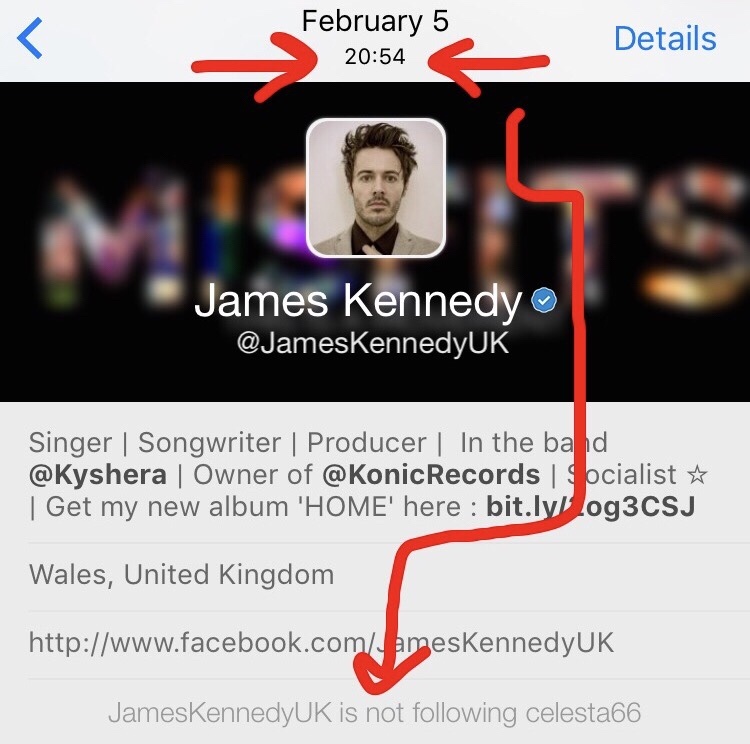 So being very busy myself with being an instant disabled person and not being able to tweet James Kennedy UK and thank him soooooo much for the RE-follow again, I let the whole celeb follower issue go and moved to some more serious business: my almost chopped off thumb which got stuck to my iPhone because of too enthusiastic insane adhesive ouchy tape. You got me confused James! You followed me first remember, then you unfollow me, then you RE-follow me and now you are AGAIN unfollowing me!!!!!! Well I don’t know if James is ever going to speak to me. 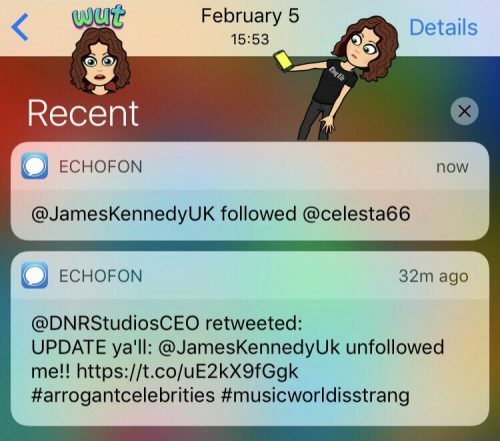 I think I know why he unfollowed me again; he checked my website and probably somewhere down the useless caboodles it came to his vision that I am offically part of the journalist slash media club; which means I AM the Paperazzi, but then the good kind, but I think James doesn’t know that because he doesn’t know me that well and celebrities hate Paperazzi and eveything journalisticio (no spell check; this word didn’t exist until now). Or it had to do with my age. One of those reasons. More moran blogs will be following as soon as I am recovered from the flu, a not-concussion and a hyper sensitive thumb including giant cut in it. Oh and also from this follow-unfollow-follow-unfollow confusion. Best Faceversary ever with not-concussions and chopped off thumb and all….